A lot of questions will cross your mind when you decide to start-up. The most common one? What exactly is right time in a person’s life to enter the market? This is when many aspects like experience, contacts, decisiveness, energy and responsibility start playing their roles. Read on to find out what role your age plays when starting up! Of the 5,000 start-ups in the study conducted by Liz Kammel, a writer in the Forbes magazine, 48% had founders of 45 years or older. A full of 64% of surviving companies were headed by entrepreneurs in 45 and up grown. According to another study, conducted by Vivek Wadhwa, a Duke University researcher, more than 500 start-ups in high growth industries showed that the average founder of a successful company had launched his venture at the high age of 40. So, data seems to show that older entrepreneurs are starting greater number of high growth start-ups with high statistical chances to survive. But according to Rob Salkoswitz, a 'Fast Company' writer, the kinds of businesses young entrepreneurs have, make a much bigger impact when they succeed. Talking about experience, the older entrepreneurs are certainly at the higher end of this scale. For starting a business, experience is a must. The older entrepreneurs have a detailed knowledge of the market along-with how things work in certain industries. This understanding helps them scale things at a faster rate, in-turn achieving maximum in a short period of time. While even though the older ones have experience in certain arenas, this experience may not always be a boon. In today’s world of rapidly changing trends, the younger ones, that are keen on keeping up to-date with particular changes, have a better advantage at keeping with the pace of the market, consumer as well as retailer. With older entrepreneurs, certain decisions might be the result of a paranoia owing to their experiences earlier. This may not be the case with the younger generation of entrepreneurs. Looking for experiences, taking riskier decisions is their way of making their mark. Both of these have an equal rate of success also depending on the particular market situation at the time of certain decision. Through years of experience, older entrepreneurs develop a certain degree of credit in the various industries they’ve dealt with. Their network is a small but strong community based on years of working together and mutual trust. The younger generation of entrepreneurs, starting out new, tend to develop relationships in a more open way, based on an informal friendship as well as work. This network is spread far and wide and opens a well of opportunities. Older entrepreneurs take calculated risks owing to the white hair on their heads. This reduces the chances of the situation collapsing. Whereas the younger ones tend to take brave impulsive decisions which have higher chances of collapsing but, opens up a new set of experience base. A rather bold statement to make but I think we can all agree that, to some extent, most often the decisions by older entrepreneurs are ruled over by logic while those of the younger ones are ruled over by emotions. An observation we make is also that when old entrepreneurs work on their start-ups, they might not invest a lot but have a lot to lose. They have many responsibilities and a family dependent upon them which makes it a lot more-risky to invest entirely in an independent project that has high chances of collapsing. Whereas the younger ones are free from major responsibilities and have relatively less to lose. After all, for the older ones, it’s more of a risk and for the younger ones, more of an experience. 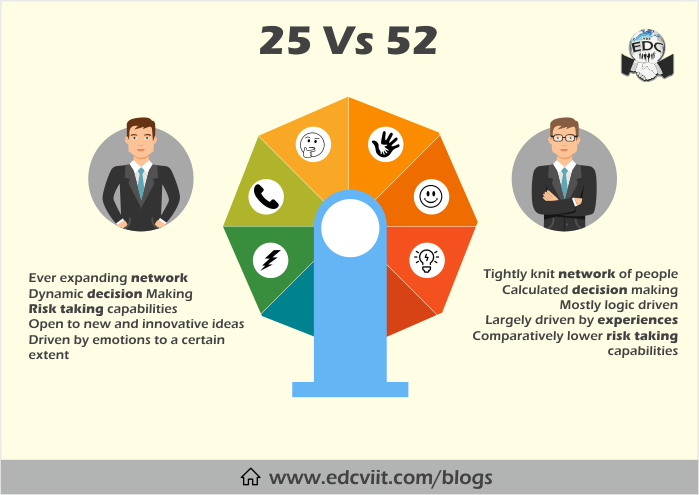 Considering this analysis, we come to the conclusion that both younger and older entrepreneurs have their advantages as well as disadvantages. Inspite of having different routes towards success, “success is achieved when you are too busy looking for it”.